One day leaving the guesthouse where I stayed in Viñales/Cuba for a walk, I almost immediately stumbled into this scene. The horse, probably fatigued and mal nourished had slipped. 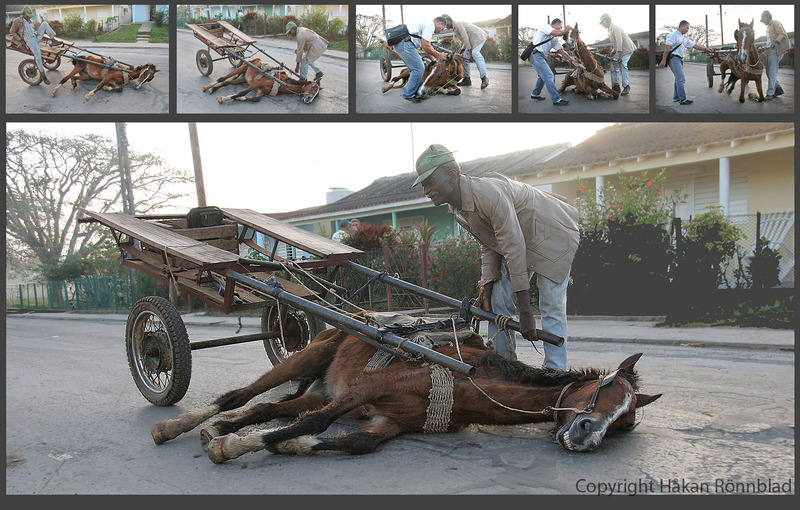 The owner eventually got some help to put the horse on his feet and a bit later they continued to wherever they where heading…. This entry was posted in Animals, Cuba, photography, Street photography and tagged angel, animals, Cuba, cuba fidel, El Caballo, fatigued, Fidel Castro, guesthouse, mal nourished, Pinar del Rio, Street photography, travel, Viñales, Work. Bookmark the permalink. You show in this story that by helping animals in poor countries, and especially farm animals (with food, veterinary care, information) you are also helping people, the owners who rely on them. It can also be the other way around of course; when people get better income and knowledge the animals will get a better and stronger life. I guess this poor horse do not get enough food.. Interesting observation there. You are probably right.